We often live in Outlook, and as a result it can become a hoarders paradise to store emails and attachments that you *might* need access to somewhere in the distant future. Unfortunately over time this results in a MASSIVE email mailbox, which not only slows down Outlook (and the rest of your computer), but can make finding that important email or attachment more difficult. There are a number of very valid reasons why we all end up storing emails in Outlook for later reference, but to avoid ending up with an overly large mailbox, slow computer and possible data corruption (Outlook can crash if the data file gets too big!) we should store attachments to a server, cloud file storage system, or document management system and then REMOVE the attachment from our email – leaving the email message itself (if necessary). Are You An Email Hoard? 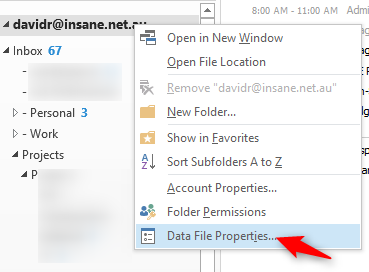 To work out whether you may have a hoarding problem, open up Outlook and right click the top of the folder tree that says your name (or email address) and click Data File Properties. On the Properties screen select Folder Size. If your emails are stored on a server you may have two tabs “Local Data” and “Server Data” and should click Server Data to see how much ‘junk’ you may be leaving on the Server. In my case, I’ve got about 1.5Gb (1,500,000 KB) on the Server. Our recommendation is to try and keep this below 3 GB. Yes Outlook supports much bigger. 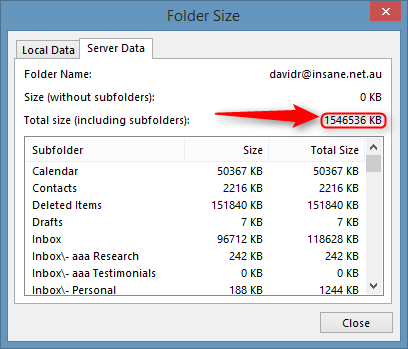 Yes Google Apps and Office 365 offer mailbox storage sizes over 20 GB these days, but do you REALLY need to store that much JUNK in there? If your mailbox gets corrupt (for whatever reason) you could LOSE valuable data and depending on how your systems are setup, your mailbox may NOT be getting backed up; whereas there’s a much higher chance your server file system or cloud/hosted file system IS being backed up. So here’s how to reduce your Mailbox and make sure critical files are being backed up and accessible by other members of your team, if they NEED it! First step, find an email with an attachment. Open the email and Right Click the attachment. The following popup should appear. Select “Save As” or “Save All Attachments” and then locate a suitable location to store the file(s), renaming them as appropriate. NOTE: If you do “Save All Attachments” you will save the files with the filename as given. If you select each file separately and select “Save As” you can rename the file as you store it. This would be my preference. We would recommend you store anything relating to a client to the client’s folder on your Company shared drive. Anything relating to your business in a folder that is shared on your Company for that particular Department, Vendor, etc. Very few files will need to be stored on a User Drive, where no one else has access to it. Even though it may not be your business, you should get into a habit of considering the best location for a file so that EVERYONE in your business could find it if they needed it (because you were sick, the client called, or other reasons). 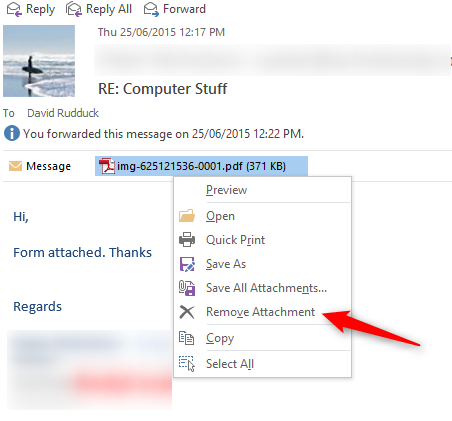 Once you’ve saved the attachment(s) to a suitable location, you can then remove the attachment by clicking the attachment (once with your left mouse button) then right clicking the attachment and selecting Remove Attachment. 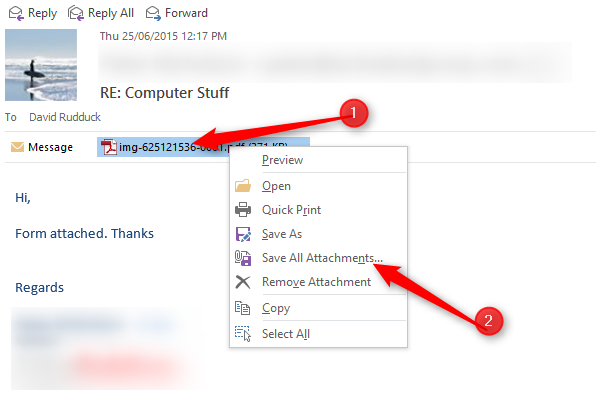 This will remove the file from the email, but leave the email message body there in case you need it. 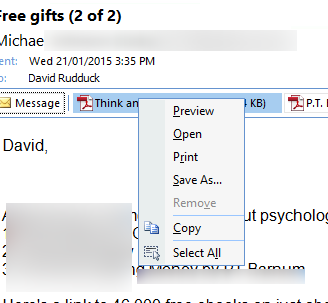 In older versions of Outlook you may not have the menu option “Remove Attachment”. You may have “Remove” – if this is missing (or greyed out), simply select the attachment (click once with your left mouse button) and then press the DELETE key on your keyboard and it will have the same effect. 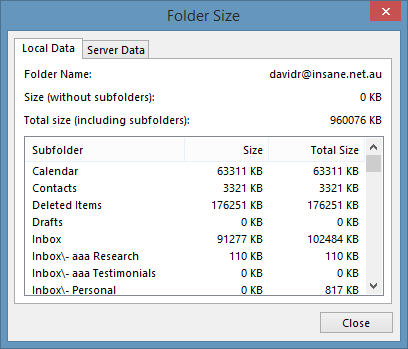 If you need help finding all the emails in your Inbox (or another folder) that may need archiving, you can sort the message list by File Size. 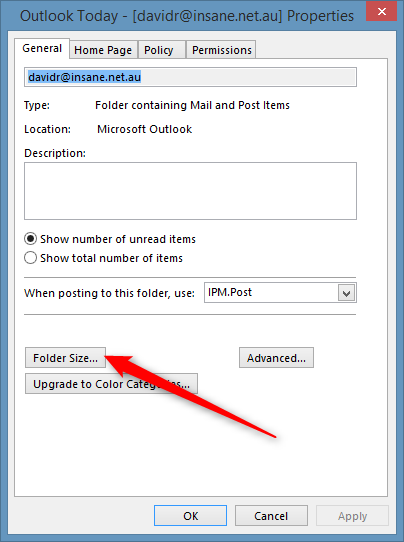 In Outlook 2013 (Outlook 365) you can click the column that normally says By Date and select Size or Attachments to show you in order all large emails/attachments. 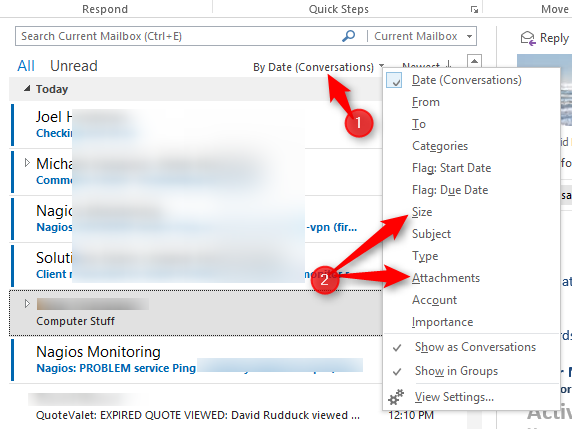 If you’re using a slightly older version of Outlook, the same screen might look like this. Simply click the column named Size and it should sort by size. Just click the column Received to change it back to by date. If you are missing that Column, you may need to reset your views/columns which is a bit outside the scope of this document!